TOKYO – Hyundai Motor Co., playing catch-up in the booming North American crossover market, is banking on a bigger, more modern redesign of the Santa Fe to lift its fortunes in the important segment. 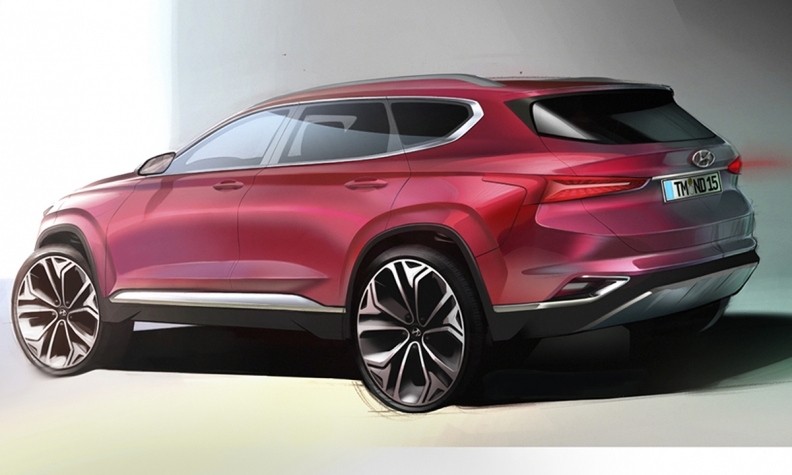 Fresh renderings of the fourth-generation midsize crossover released Tuesday show a sleeker, sportier Santa Fe that adopts the brand’s new split-level lighting array up front. Like the subcompact Kona crossover unveiled last year, the next Santa Fe gets sliver-thin daytime running lamps positioned high along the hood crease, while the main headlamps sit low on the sides of the grille. The novel setup creates “a unique, futuristic look,” Hyundai said. The grille gets a three-dimensional “cascade” treatment. Along the side, a long character line runs from the headlights to the tail, giving the redesign a stronger shoulder than its predecessor. The company did not disclose technical specifications of the vehicle, which is expected to grow bigger. More details are expected to come ahead of its release in South Korea next month. Hyundai is racing to beef up its light-truck offerings as customers go cold on cars. It’s also looking for Santa Fe sales to rebound in Canada. The automaker sold 28,402 units of the vehicle in Canada in 2017, a 12 per cent drop from the 32,263 in 2016, when the vehicle was the automaker’s best-selling vehicle in Canada. Total Hyundai sales in Canada were also down in 2017. The automaker sold 130,221 vehicles, a 5.7 per cent decline from the 138,162 the year before. The automaker also saw its U.S. sales slump 13 per cent last year in an overall market down 1.8 per cent. 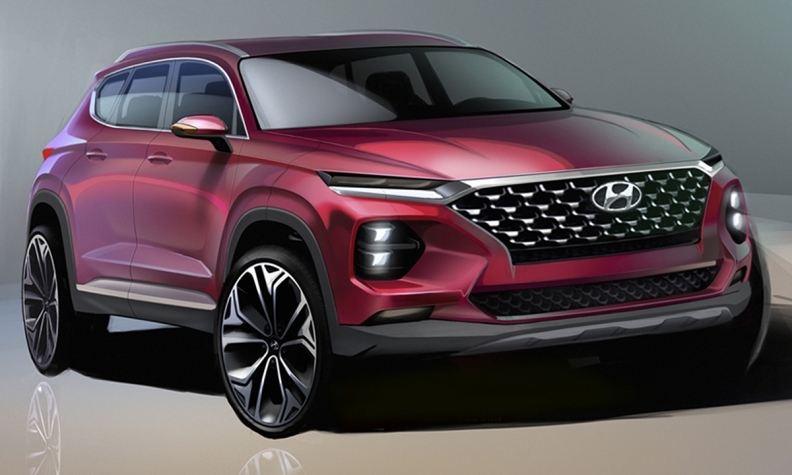 To rebalance its car-heavy lineup, Hyundai plans to introduce eight new or redesigned crossovers to North America by 2020. Offerings will expand to cover the Kona, as well as crossovers running on new drivetrains such as all-electric and hydrogen fuel cell variants. Hyundai’s modest three-nameplate crossover lineup comprises the Santa Fe, shorter-wheelbase Santa Fe Sport and the Tucson. The competing Toyota brand, by contrast, offers seven crossover and SUV nameplates in the U.S. — six in Canada, where the Land Cruiser is not available — plus two pickups. The U.S.-built Santa Fe, in two- and three-row versions, is Hyundai’s top-selling light truck in the United States but it’s second-best seller in Canada, behind the Tuscon. U.S. sales of the Santa Fe rose 1.5 per cent to 133,171 last year. Sales of the imported compact Tucson rose 28 per cent to 114,735 units. With the launch of the next-generation Santa Fe, some speculate Hyundai will split the long- and short-wheelbase variants into separate nameplates to better diversify the lineup.